NYU's Stern School of Business transformed its student orientation process into a two-day program focused on collaborative learning and innovative tech tools. 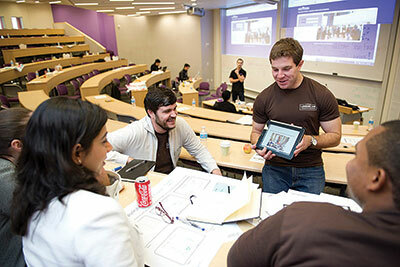 At NYU's Stern School of Business, the orientation experience for new students once involved a passive lecture/presentation process of sitting through a day of "introductions" to various aspects of the business school program, curriculum and administrivia. But in the past year, Stern has transformed its orientation into the Langone Lab, a two-day program that immerses students in an experiential exploration of the possibilities of their upcoming semesters in business school. Cutting-edge technology — such as wearable devices — is a key part of the authentic learning experience, enabling students to capture their experiences firsthand. As Maya Georgieva, project lead and associate director of the school's Center for Innovation in Teaching and Learning, explained, "Wearable technology is very new in the context of education. For us, this is an experiment. But our immediate objective is to encourage students to see business education as having a lot more potential than it used to have. Now, it's more exploratory; it's not just a set curriculum that they have to follow." During the Langone Lab orientation, students participate in a collaborative design thinking activity and are asked to come with an idea for a new product or service. They work in teams to create a new service, product or an idea that directly affects their lives. In the latest orientation lab, students used Apple iPads and the ExplainEverything App from MorrisCooke to prototype their ideas and create a digital record of the potential user experience. Students recorded their work with Google Glass and the Narrative Clip Lifelogging camera. Georgieva and her colleagues hope the program will expose students to a process of collaborative learning that maintains a balance between creative intuition and analytical rigor; challenges students to "think disruptively;" facilitates experiential learning using digital tools; and inspires students to envision new possibilities for their future careers. It also establishes the notions of participation, collaboration and authentic learning as cultural mainstays of the business curriculum. The Langone Lab orientation has also fostered a new dynamic of innovation throughout the school, perceived by faculty and staff as an organic process that allows the institution to evolve with new developments in the digital revolution. The technologies used in the lab are being incorporated into courses; for example, students take the Narrative Clip camera on field trips and use Google Glass to augment, share and expand their learning. In particular, Georgieva expects the use of wearable technology to have broader implications going foward: "In the not so far future, we should be able to get more useful feedback based on students using the wearable technology throughout the day. In short, we can 'be there' without disruption — without bringing cameras, lighting and a crew. Today, it's really just a video journal. But as we continue with wearable technology, and wearable technology continues to evolve, it will connect to big data and new opportunities for feedback." For more information on the Campus Technology Innovators program, visit the awards site. Meg Lloyd is a Northern California-based freelance writer.